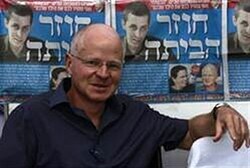 Gilad Shalit’s father blames terror victims families for murdering Muslims being freed. Noam Shalit implied the bereaved families of terror victims were to blame for the release of their relatives’ murderers on Monday, saying a better deal could have brokered if they had joined his crusade to secure his son’s freedom. “I regret the bereaved families who oppose this deal were not with us at the time we tried to create pressure on the Israeli government to turn leverage on Hamas,” Shalit said. This entry was posted on Monday, October 17th, 2011 at 16:30 and is filed under Main Postings. You can follow any responses to this entry through the RSS 2.0 feed. You can leave a response, or trackback from your own site. 3 Responses to Gilad Shalit’s father blames terror victims families for murdering Muslims being freed. I don’t know Kenny. This is NOT the Israel my husband taught me about. I can’t react to this with anything other than disbelief.